Reprinted with permission of The Jewish Journal of Greater Los Angeles. It all began with a Purim spiel. 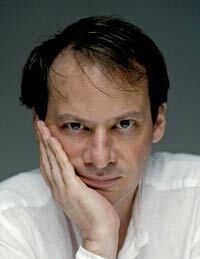 Seven years ago, the much-loved New Yorker magazine writer Adam Gopnik was living in a kind of secular New York Jewish limbo. Then he got an invitation from the Jewish Museum to serve as Purimspieler–the one who tells the Purim story. That single invitation was the catalyst for an investigation of a whole lot of topics, not least “The Rise and Fall of Jewish Comedy,” which Gopnik will address in Los Angeles at a festival sponsored by Nextbook this Sunday. In other words, if it weren’t for Purim, Gopnik wouldn’t be coming to UCLA this weekend. He wouldn’t be talking about Jews and comedy or, for that matter, about being a Jew himself. He might not even be giving any of those subjects a second thought. Gopnik was born in 1956 in Philadelphia and raised in Montreal. To those who follow his writings, it would seem that he is curious about just about anything, and one small incident in daily life can lead to 47 books perused, a world of sideline distractions and anecdotes and colorful detail. Anyone who knows his work, which has graced the pages of The New Yorker since 1986, knows that he easily blends discourse on the death of Anna Nicole Smith with the alleged recovery of the resting place of Jesus. Gopnik is able to weave his family’s exploits–particularly those of his lively and clearly bright son, Luke–into his intellectual pursuits; he is both neurotically curious and genuinely and infectiously in love with today’s urban life–particularly that of New York and Paris. And thus began Gopnik’s quest to uncover the meaning of Purim, the meaning of being Jewish to a secular Jew and, perhaps, even the meaning of faith. Where some might seek to explore such issues in conversation with a few friends over dinner, or perhaps by taking an adult education class, or maybe by running off to the nearest bookstore only to become overwhelmed, Gopnik did his research by going on Sunday mornings to a deli with his son. He also, as is his style, called up the leading authority, someone who would seem to have little time for novices, and, with the weight of the New Yorker imprimatur and the seeming guilessness that is his charm, got an audience. This time it was Rabbi Ismar Schorsch, then chancellor of the Jewish Theological Seminary. Schorsch discovered that Gopnik was using a Christian Bible for his research, and went on to explain, impress and, perhaps, even to elucidate Gopnik, who in the end, found his faith in Jewish humor, not God. Nextbook , the hip, alert Jewish Web site, spent some time talking to Gopnik about this tale, then followed up by inviting him to Los Angeles. It’s hard to resist a guy who’s so curious, yet who also sets himself up as being a little, well, naïve. I called Gopnik last week to talk about his Jewishness and comedy and to see what he was really like. I’d been reading his work since he first started writing for The New Yorker about art–he’d been a student of art history at the Institute of Fine Arts at New York University, where I also attended, though not at the same time. And I’d followed the arc of his career from art critic (a role I shared at the time in a much less high-profile way) to essayist and diarist. Not long ago, he wrote at length about the death of his daughter’s betta fish, Bluie, in a side-splittingly funny style, and like most parents of our ilk, my daughter had also had a betta for a short while. I felt like I sort of knew Gopnik, and, well, I’m a fan. Gopnik answered his home phone on a weekday evening, and in the course of our conversation, he was interrupted regularly by his children, who were alternately very excited about an upcoming hockey game on TV that evening and wanting him to say goodbye to the piano teacher, who was leaving after their lesson. He excused himself each time in midsentence and with complete patience in his voice, responded to the kids and then returned to our discourse with equal aplomb. High and Low, the name of an art museum catalog he authored in 1991 for a show at the Museum of Modern Art, could be his own middle name. So the link between humor and theology, which I’d called to ask about, seemed right up his alley. Gopnik’s mother is of Sephardi origin, and her grandfather was a “rabbi from a distinguished rabbinical family in Hebron, in Palestine as they still called it, who went to Lisbon to reopen the synagogue before the First World War.” That family, he said, were Levantine and also highly European, speaking French and German, with strong ties to South America and North Africa. His is the dilemma of much modern Jewry–sentimental about the seder, secular in their beliefs, belonging to no synagogue. He is totally Jewish in his outlook–in terms of pursing justice (Gopnik has become an advocate for universal health coverage), in terms of intellectual questioning (no argument goes without multiple sides, even when only one person is talking) and in terms of his love of humor. Which brought us back to the topic that makes him feel most comfortable as a Jew: jokes. As he wrote the story of his pursuit of his Purimspiel gig, Gopnik remembers his grandfather, the butcher whose greatest joy was that two of his grandchildren have degrees from Oxford (Gopnik’s siblings), but whose parlance was pure vaudeville: “Feel stiff in the joints? Stay out of the joints!” Gopnik’s son, Luke, still in grade school at the time of the essay, is also a joke teller: “Daddy, did I tell you the new version?” Gopnik quotes his prodigy-progeny. Gopnik talks pretty much the same way that he writes: long sentences, lots of asides, a kind of sweet emphasis on details. He is (surprisingly) self-deprecating and (not surprisingly) engaging for someone so accomplished, and as he casually mentions dozens of books he’s just read, he seems less interested in impressing than of being precise. Larry David’s “Curb Your Enthusiasm” goes even further, making the context a Jewish guy entirely wealthy and arrived. “If you were a scholar,” Gopnik suggests, “you could say it’s a classic form of Jewish humor; he’s the schlemiel, he’s the smart guy, and all that’s true. What marks much of Gopnik’s writing is an unapologetic sentimentalism, amid all the questioning. That, too, may be one of the bigger changes since the ironic, uncomfortable, edgy stance of an earlier generation that was not only aspirational but also uncomfortable about it. And the trick in making his own work both humorous and a little weepy is part of what makes it so familiar and, perhaps, even comfortable for many of us. In the early 20th century, the painter artist Henri Matisse got into trouble with his avant-garde contemporaries when he said that he dreamt of an art that could have the effect of a good armchair, an escape from life. Having said that, though, Matisse continued to push boundaries of artistic representation to the limits through his use of simplified lines and bold color. Likewise, as we read Gopnik’s story of the Purimspiel and of his son’s attempts to refine comic timing, and of his own quest for how to tell Esther’s story anew, it’s easy just to get lost in the yarn, with all its color. Gopnik pushes us to explore the limits between today’s Jews and the surrounding culture. To help him figure out who is and who is not. To see whether we all think the same things are funny these days. One of the great beauties of Judaism is that it lives on the line between intellect and sentiment, between probing and faith. It’s not all about God, and Gopnik’s beliefs and observance are hardly what would make us know him as a Jew. But I don’t have to say any of that, because his son already told him, with perfect comic timing. Susan Freudenheim is managing editor of The Jewish Journal of Greater Los Angeles.